So the quince season is here once again. Huzzah! is all we can say. There is nothing quite like it for fragrance, natural pinkness and beguiling flavour. Although they are ugly brutes. They are not very good raw, but poached simply with honey, ginger, cardamom and cinnamon sticks they form possibly the world’s best ‘compote’ (to use the ‘Iranian’ vernacular). To stew them thus remove the skin and cut into segments, BUT LEAVE THE PIPS IN as that is where all the pinkness and goodness lies. 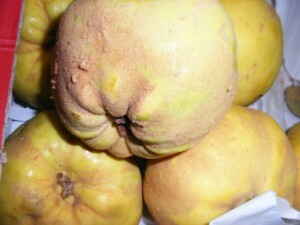 Quince pips are astonishingly good for the chest/chesty coughs. Mother Nature certainly knew what she was doing by making quince a Winter fruit, as it is the perfect remedy for so many seasonal ills. Soak the split peas in water for around half an hour. When you are ready to cook fry the onion and celery in some oil in a saucepan; when they have softened add the turmeric, lime powder and (drained) split peas. Fry for a few minutes, stirring well, and then add the tomato paste and water. Bring to the boil and simmer for ten minutes. So to the quinces: peel and core them (Iranian housewives would retain the pips to use as a decoction for coughs) and cut them into thick slices. After ten minutes add the quince to the khoresht along with the coriander. Cook for around twenty minutes, or until the quince is just cooked and the split peas are soft, and then add the spinach and season to taste. I like sharp things, but you may well find the addition of sugar necessary. Bubble for a few minutes more and then serve with steamed basmati rice and some nice thick yoghurt. This entry was posted in Recipes and tagged khoresht-e-beh, quince casserole, vegan. Bookmark the permalink.